King Abdullah II Al-Hussein, the head of state of the Hashemite Kingdom of Jordan. 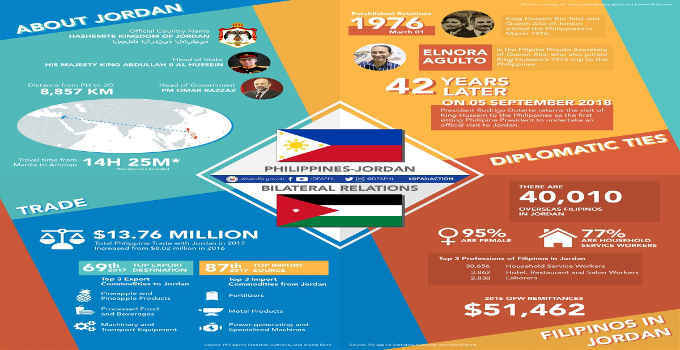 The Philippines and Jordan established relations on March 1, 1976. King Hussein Bin Talal and Queen Alia of Jordan visited the Philippines in March 1976. Hussein’s 1976 trip to the Philippines. undertake an official visit to Jordan. restaurants, and Salon workers, and laborers. Statistics show that in 2016, OFW’s remittance from Jordan is $51,462. The travel time from Manila to Amman is 14 hours and 25 minutes. The total Philippine trade with Jordan in 2017 is $13.76 million. cooperation with the Middle Eastern nation to fight extremism. bringing home $60.675 million in Jordanian investments.